Hi, guitar players! We want you to achieve your musical goals in 2017, so let’s do this! 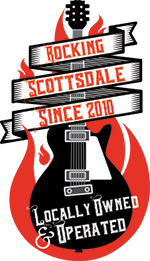 We’re Scottsdale’s leading music academy for beginning and intermediate musicians, and we want to help you get better on your chosen instrument. Our talented music instructors work with you and your schedule and budget, to help you move ahead! Today’s rock ‘n roll guitar tutorial from Scottsdale Music Academy founder John Davis unlocks the secret to playing Led Zeppelin’s “Black Dog”, the 1971 opening track on their 4th LP, also know as Zofo. Legend has it the band wrote the song about a nameless black dog that wandered the grounds at Headley Grange studios during the recording of the album songs. In the video below, John’s mastery of the song main riff is apparent from the beginning. John describes it as a “must-know” riff for any rock n roll guitar player worth his strings. Most of the main riff is focused around the A chord, showcasing how inventive Jimmy Page’s talents as a guitar player shone through. John shows how to start on the 5th fret and playing the 7th fret D string with your third finger, you use upstrokes to get the rhythm right for the main riff. It’s a fast riff on the recording, but John slows it down and breaks it up into small sections for you to listen to each one, find the right playing pattern and rhythm, and start to get comfortable with the finger placements and picking patterns. At the video’s 4:00 mark, John starts to show you the next part, which is nearly identical to the first part of the song, except that it moves down to the E string instead of the A string. This part also comes down in a different part of the song’s rhythm, making it sound like a different part of the song, but it’s pretty easy once you figure out the part vs. the rhythm. Then comes a transition part that brings you back to the A string part from the E string part. That will bring you back to the first main riff. Have some fun with the riff, and take the time to practice it and make it your own! Scottsdale Music Academy is the HOTTEST music school in Scottsdale, AZ. 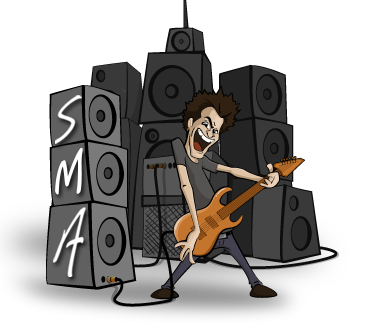 At SMA, both youth and adult students can learn to play faster and with more confidence. Our instructors all play out professionally and know what it takes to take your playing to the next level. We’ll help you improve your guitar-playing ability. Contact us at Scottsdale Music Academy at 602-751-3537 today for your FREE first lesson!